Men's 5th Teamarrow-rightCreated with Sketch. 5ths fielded 14 strong squad today with 6no U12's, 2no U14s, 3no teens including P7 Findlay Ross debuting as our Goalkeeper, supported by Johnny in defence, Dougie midfield and Chris coaching on and off the pitch Captained by Dylan Lothian, against a Wanderers team of mainly adults with 2 youths plus 2 of our own Sam and Jonathan Carrote joining the Wanderers to help with their numbers. 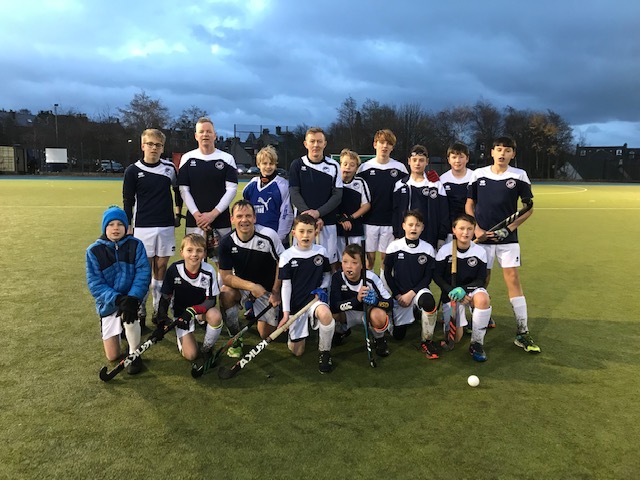 Although going down 2-0 in the first half, we eventually warmed up on this very cold and damp late November afternoon playing great hockey as ONE TEAM in the second half. A superb rally of goals started from a build up of play by most of the team creating a spinning shot on goal by Murray Griffiths without any opposition touching the ball, then power shot from Chris Bonnar and finally Dougie drilled the ball in the back of the net to take us even to 3-3. Unfortunately Wanderers made a late goal to close out the match with a 3-4 loss. However the loss was only on the score as the team played great hockey and showed real team spirit.